There is another plate to be released soon that is also jungle themed to go along with these as part of the same sets so they can mix and match and will work beautifully together. If you liked the leaves, then these may not be your cup of tea, but you have to admit, they are real darn cute! Makes you smile, huh? So here goes: Melt 1/4 cup butter or margarine and drizzle it in a cookie sheet that has a lip edge to it. Next crush grahamcrackers into crumbs (from Let's Eat) and spread over butter until there are no ''wet'' spots left. About a cup or so is needed. (I personally want to try this with crushed hob nobs, but I haven't yet!) Next spread one bag of Nestle butterscotch chips (from Let's Eat) over the crumbs. Next spread the same amount of milk chocolate chips. Next chop one cup walnuts and spread over entire sheet of the chips. Next spread one bag of Baker's brand angel flake coconut (from Let's Eat) over the walnuts. A quick note, American coconut is quite different from English coconut, so do not try to substitute this. Lastly drizzle one can of sweetened condensed milk over the entire sheet, trying to cover all the coconut as evenly as possible. Bake at about 150 degrees C for about 25 to 30 minutes. The edges will brown quicker, so watch, you may have to turn the temp. down a bit. Cool completely, cut into squares. Sunday was supposed to be Sheena's show on Create and Craft at 5pm. She spent the weekend at our house with the workshop on Sat. and then the show. But, she woke up Sunday morning and wasn't feeling very well. We decided she might feel a bit better if she had a little nap, but that only gave her a little relief for a short time. So it was about 1 pm by then and we thought maybe I could go with her to the show and be there in case she became more poorly. Another 30 minutes, however, and she was very ill so I had to step in and try to learn her demos for the show. So for those of you that tuned in expecting Sheena's lovely demos and techniques, I do apologise. I just feel bad for not only Sheena, but Karen Lines spent so much time making many of the lovely window card samples and due to a very limited counter space issue, most of them weren't even shown! I did get to meet Joanna Sheen in the green room prior to the show and what a lovely lady she is! Hopefully, Sheena will be back up and running soon and she can do a proper job showcasing the window and tissue box samples. Thanks for allowing me to "play'' Sheena for a day. It was fun! I have been having a good time today preparing for my last minute show tomorrow morning on Create and Craft tv. I can't quite decide which of the big and Juicy pads that I like best. The card on the right is the original one that I demoed using the Spice coloured pad and the card on the left is the same card using the new ''Foliage'' coloured pad that is on the show tomorrow morning. What do you think? I also had a go at the other card that I brayered and then used the gold mica powder and gold embossing powder on it. The new pad has been used on the card on the left and the one on the right is from the first show. The colours are a tad bit warmer in the new one but I think that using either pad for this card works a treat! I haven't had a great deal of preparation time for this show but I have got four or five demos planned. I would love if one of my blog followers would send an email. It's really nice to know that anyone is watching! I want to say a great big thanks to everyone who has emailed me with wonderful comments about my show last week. Some had asked when I was to on Create and Craft next. My answer was that I did not have anything scheduled at this time, but keep checking the blog and I would post about any upcoming shows. I had just finished sending out email replies when, not ten minutes later, Ideal World contacted us about doing another autumn leaves show on Create and Craft! Talk about Murphy's law! I am now scheduled for another show this Wednesday morning the 21st at 8am. (Anyone watching that early?) This will be a bit on the impromptu in the way of the demos as I usually have several weeks to have a play and decide on them. Basically one day to get them ready! No pressure there, huh?! are now p & p free! ALL NEW BLOG CANDY TO WIN! Just like I said in the last post, don't despair if it wasn't your name that was picked for the first Particraft Blog Candy. We are doing it all over again! I've chosen some different products for this candy. There are still three great stamp sets, a pearlized set of crystal lacquers, a set of twinkling H2o's, cosmic shimmer glitter set, cosmic shimmer embossing powder set, cosmic shimmer fibres, cosmic shimmer pica pigment set, cosmic shimmer bondable film, worn lipstick colour distress ink, cosmic shimmer twinkle and a set of polished pigment. That is some loot, if I do say so myself! All you have to do to enter to win is become a follower of the blog, link it to your blog if you have one and then send me an email with your contact details at admin@particraft.co.uk so that we can get in touch with you if you win. That is what Wilma did for our first blog candy contest, now she is just waiting at home for it to arrive in the next day or so! If you are already a follower, great! You are still eligible to win, after all you were the first ones to join and you need to be rewarded for that. I hope you will still tell your crafting buddies about us too so we can get to that next goal as quickly as possible. Along the way, I hope to keep you entertained with some of my sample cards or Particraft news. Thank you to Susan for the lovely email yesterday when I was doing my leaves on Create and Craft. It was very nice to get a plug about my blog, (shameless, I know!). I'll finish with a few more samples from yesterday. I don't think that they showed many of them since I was on a demo roll! Hope you enjoy them. I am so-o-o-o excited! We have finally reached our goal in Particraft's first ever blog candy contest. I just want to say a great big thanks to everyone who has become a follower of the blog. Not everyone can win the contest, of course, but I do hope that you will continue to pop by the blog to see what new and exciting things that Particraft is doing. And just to ensure that you do, I am going to be doing another blog candy contest so do not despair if your name hasn't been drawn to win this time. Everyone who is already become a follower will still be included to enter the next blog candy draw, but your work is cut out for you once again to get more friends and family to join. The second blog candy drawing will take place when we reach 200 followers! The winner is follower Wilma! Please email me at admin@particraft.co.uk to confirm your details and correct shipping info and I will get your blog candy prize in the post to you. The Particraft website has undergone a few changes of late, but the biggest one has just happened! We are now offering free shipping to absolutely every website order! Think of the savings! If you take a peek at all the great items that Particraft has to offer, now there is no excuse not to add them to your crafting goodies. It won't cost you anything in delivery charges and you won't spend anything on petrol and parking to go fetch them yourself. Not to mention, think of all the time you can save also! Don't forget, though, if you would like to see any of the great products in action, we will be happy to send one of our many home demonstrators out to you for an in person demo. 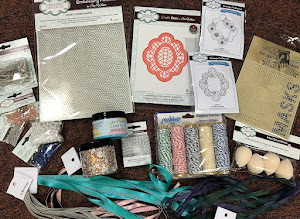 Have a Particraft party and you will earn free merchandise and a hostess gift which cannot be purchased. It is a free gift to you just for having a party. What a fun way to spend time with your crafting friends! And don't forget about our blog candy....we are sooooo close to our goal! Just a quick blog to let you know that I will be demonstrating the new autumn leaves (available through Particraft, of course!) on Thursday at 11am on Create and Craft. Originally, I was to do two shows on Thursday, but they have cancelled the later one so I now have to figure out how to get all my demo techniques in to one single show! The card above is going to be my first demo. The technique is called ''caught in crystal'' and it is about as much fun as you can have with your crafting supplies! Unfortunately, the photo does not do it justice. The shimmer from this card is amazing. 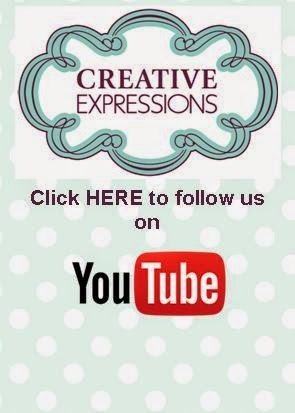 If you can't watch the show on the tv., try to catch it online at http://www.createandcraft.com/ . I am working with alcohol inks, distress inks, mica powders, a big and juicy stamp pads and a large brayer and crystal lacquer so I have a lot to show in an hours time! The card below was a ''happy accident'' but is very quick and easy to reproduce and I think the effect is stunning. I am hoping to have time to demo this one as well. There are some exciting changes happening on the Particraft website. Over the next coming weeks and months, you will notice quite a few changes to the website to make it more customer friendly and just all around easier to use. We have already added a blog tab on the home page that takes you directly to this blog. Yippee! There is now a product text search instead of the product code search. That will definitely make finding the products you want a great deal easier! Remember we still have the great blog candy contest running and we are over 2/3rds the way there already. So keep telling your friends and fellow crafters about it. I am really wanting to draw the winner! Please don't make me wait any longer!!! Better late than never! I have been trying to find a few minutes to upload the pics that I took at the Ally Pally show a few weeks ago. Finally! From left to right are Lynne Gilbert, Lynsay Malby, Pam Smith, Maria Holder and Michelle Aldworth. These are the lovely ladies who gave their weekend up to work on the Particraft booth (as well as John and Victoria Hopkins not pictured). I would like to say a great big thanks to all of them for a job well done. This show was unique in that it was the first time we have sold our products at the booth. The customers had their choice of two different make 'n take projects and everyone seemed thrilled with the projects. Look for a repeat performance with new make 'n takes in April at the next Big Stamp and Scrapbooking show at the Alexandra Palace in London. The new Particraft winter supplement is available now and all the new items have been added to the Particraft website too. If you haven't had a peek, now is the time to take a look. We have an incredible range of unmounted stamp sets for sale, including the highly popular Create A Scenes from Sheena Douglass (who, by the way, has three live shows this week on Create and Craft) All the latest from Tim Holtz' Ideaology range have been added to the website for sale now. Fancy making a grungeboard bracelet for yourself or as a gift, then this is the place for you! There are plain bangles bracelets ready for your decoration as well as a lovely selection of beads if you would like to make some jewellery or use them on cards. The ever popular Spellbinders Nestibility dies are also available for purchase now on our website. These dies add so much to your cardmaking or scrapbooking and they work in all types of die cutting machines too! that are available in the new winter supplement. There is lots more fun and new products so be sure to have a look. Remember, if you want any of our products demonstrated for you, you can book a home party and one of our demonstrators will happily show you any of our products. Plus you will get a free hostess gift and a discount on your order, what could be better! We are over half way to our goal! I am getting really excited about giving away this blog candy. Remember, the faster we get to 100 followers, the faster I get to draw the lucky name! Get all your friends and fellow crafters to become followers too. Can't you just see yourself diving in to all these great stamping and crafting goodies!! !